A recent study, the Burger Consumer Trend Report by Technomic, states that 39% of consumers purchase a burger from a fast food restaurant on a weekly basis. If true, this could explain the reason for the explosion of burger joints in the Boston+ area. In the suburbs, one of the newest burger additions is WuBurger, which opened in Woburn earlier this month. It's still new, but as a preliminary opinion, based on four visits, it's a worthy spot for a delicious and inexpensive burger and you should make a trip there. Located in a small strip of stores, with ample parking, WuBurger has walk-up windows where you can order your food or you can choose to sit inside. Inside, you order at the counter and then seat yourself. Dependent on the time, your food might then be delivered to you or you might be called to pick up your food. It has a kind of a casual diner feel and the food is prepared quickly so it is a good choice if you are pressed for time. I like the fact that the only item they serve which is frozen is their waffle fries. The meat for their burgers is delivered fresh and they source some of their other ingredients from local farms and vendors. They are trying to elevate the quality of fast food and be more eco-consciious while still maintaining inexpensive, fast food prices. I went to their Family & Friends opening, and then went back on my own three other times. Each time, the quality of the food was consistently good. There were a couple minor service issues but that is typical of many places when they first open and I expect they will be remedied soon enough. The star of the menu is their Burger, which comes as a Single Patty ($4.50) or Double Patty ($6.50) and is served on a Martin's Potato or Sesame roll. Complimentary Toppings include: Lettuce, Tomato, Raw Onion, Pickles, Relish, Ketchup, Mustard, & Mayo, For $0.50 per topping, you can also add: Wu Sauce, Grilled Onions, Grilled Mushrooms, Jalapeno, American Cheese, Cheddar Cheese, & Swiss Cheese. And for $1.00 per topping, you can add Applewood Smoked Bacon, Blue Cheese, Fried Egg, Crispy Fried Onions, & Homemade Chili. There are plenty of options to customize your burger so you can experience something different every time you visit. They have several other sandwiches ($3.50-$7.00) including a Veggie Burger, Grilled Cheese, Roast Beef Sandwiches, Hot Dogs, Fried Chicken Breast, and more. For sides, the main options are Waffle Fries ($3) and Hand Cut Onion Rings ($4), and you can get them topped with Bacon, Cheddar Cheese Sauce or Chili ($1 each). However, on my most recent visit, they didn't have onion rings available as there appeared to be an issue with them. I'm not sure if they are back yet or not. This is a Double Patty topped by a fried egg and cheddar cheese on a sesame bun. The burger was juicy and flavorful, enhanced by the egg and aged cheddar. The size of the bun was perfect for the rest of the sandwich. Just a damn good burger at this price. The potato roll works well too, though my personal preference is for the sesame bun. I had some of the James River BBQ sauce on this burger which added some sweet spiciness to the burger. The North Shore ($6.50) has Rare Roast Beef, American Cheese, and James River BBQ Sauce. The roast beef was cooked a perfect rare, and was tender and flavorful, enhanced by the BBQ sauce. If anything, it might be a tad smaller than what you can find at other North Shore roast beef joints. But for taste, it is spot on. They might be frozen, but the waffles fries are good, not overcooked and very few small pieces. If you want, you can get the cheddar cheese sauce on top or on the side. I also tried the chili and was very pleased with it. There are no beans in their chili and it is well spiced, meaty and delicious. I could have eaten a bowl of the chili on its own. If you want dessert, they have a full menu of ice cream treats, with the ice cream sourced from Richardson's Farm.. The X-Thick Vanilla Frappe ($7) was good and thick, though still drinkable through a straw. Have an ice cream cone or a sundae, frozen yogurt or soft serve. WuBurger has gotten off to an excellent start and I recommend that you check it out. Grab a burger, waffle fries & a shake and enjoy! You should explore the native spirits of other countries, even though it might be a bit more difficult to find them locally. I recently mentioned Sotol, an intriguing Mexican spirit, and now I'm going much further south, to Chile, to highlight the compelling Pisco. Four years ago, while touring through Chile, our van stopped at an isolated gas station in the countryside for a fill-up. There was a small grocery store attached to the station so I got out of the van to check it out, maybe to pick up a snack. However, I was amazed to find that the back of the store was taken up with several shelves of different bottles of Pisco, a well-known spirit in Chile and Peru. I bought a bottle, the Pisco Mistral pictured above, and when I brought it back to the van I told everyone else what I had found. Most of them then left the van to get some Pisco too. That gas station did a great business in Pisco that afternoon. For some background and basic information on Pisco, including its history, check out my previous post, La Mar, Pisco Sours & A Cautionary Tale, and my prior review of the Macchu Pisco La Diablada, a Peruvian Pisco. Pisco still remains relatively uncommon in the U.S. but it is a growing category and you should keep an eye out for it at your local bars and liquor stores. Pisco Mistral is owned by the Compañía de Cervecerías Unidas (CCU), the largest brewer in Chile and a producer of both alcoholic and non-alcoholic beverages. The Pisco distillery is located in the town of Pisco Elqui, in the Elqui Valley, where Pisco production was first conducted in Chile. The town was originally known as :La Greda but was changed in 1936 to help support Chile's legal claim to produce Pisco. The brand name, Mistral, is derived from the name of Gabriela Mistral, who was a native of Elqui Valley and was the first Latin-American woman to win the Nobel Prize for Literature. The distillery produces several different Piscos and I opened the Pisco Mistral 35, which is produced primarily from Pedro Ximénez and Muscat of Alexandria.grapes and aged in American oak. It has a light golden-brown color and appealing spicy aromatics. On the palate, it is soft and smooth, with pleasing flavors of vanilla, spice and mild herbal notes. It has a lengthy and satisfying finish, without any bite. You'll realize that it is a versatile spirit, one which would work well in a wide variety of cocktails. The Pisco Sour might be the most famous and common Pisco cocktail, but you can do so much more with this delightful spirit. I've been having fun with my new blender so decided to put the Pisco through the paces. I decided to create a Frozen Piscorita, a Margarita that substitutes Pisco for the Tequila. I figured the flavors were similar to what you would find in a Pisco Sour so it should work well. For the Margarita mix, I used the Squeeze from the Margaritas restaurant, which was especially appropriate as it contains egg white, which is also an important ingredient in a Pisco Sour. I used the same amount of Pisco as I would have used Tequila. The Frozen Piscorita was a big hit! It lacked the bite of tequila and there was the addition of some spicy notes as the Pisco was barrel aged. The flavors of the ingredients blended very well and the cocktail went down very easily. It would appeal to many people, including those who dislike tequila. It would be a nice introduction to Pisco and should stir the imagination as to how Pisco could be used in many other cocktails. I also made a non-frozen version and, as expected, it too worked well. Seek out some Pisco and learn more about this fascinating South American spirit. Do you have a favorite Pisco cocktail? 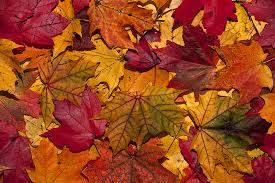 Fall in New England is a beautiful time, with the multitude of colors found in the leaves. It is a time for apple picking and hay rides, for savoring the last warm days before the chilly weather strikes. However, the autumn also brings with it a few food and drink issues, some of which I want to address today. First, Rosé wine is vanishing from the shelves of many wine stores and that's a problem. It still hasn't caught on sufficiently that Rosé is a wine that should be enjoyed year round. Besides being delicious, it is very food friendly and works with plenty of fall and winter dishes. I've ranted before about this issue and will continue to do so until wine stores wake up and start stocking Rosé 365 days a year. There are some wine stores who understand, who keep stocking Rosé, and they deserve your support and kudos. Tell your local wine shop to carry Rosé even when the trees are bare and even when snow falls on the streets. Second, apples are such a wonderful and versatile fruit but they can be the subject of a few issues. At many fall markets, carnivals, festivals and more, you'll find candy and caramel apples, which might be covered with coconut, nuts, colored jimmies or other items. Candy apples were invented first, around the turn of the century, though their exact origin is murky. Candy apples, with their distinctive red candy shell, are usually made with a flavored boiled sugar recipe. Caramel apples, made with melted caramel, were first developed by Kraft Foods in the 1950s. The popularity of each varies across the country, though I have been noticing, to my dismay, an increase in the ubiquity of caramel apples locally. I love candy apples, especially covered with coconut. It is not always easy to take that first crunchy bit of a candy apple, breaking through the hard shell, but it is rewarding. With a fresh, crisp apple, the candy, coconut and fruit make for a very appealing treat. For me, the caramel apple fails. I love caramel, from a nice sweet sauce atop ice cream to a salted, gooey center of a dark chocolate. But I don't like its soft gooey texture on a caramel apple. It is too soft, and just doesn't seem complementary to the crisp apple. Third, with apples come Cider Donuts, one of the best foods that exists. I love, love cider donuts but I am also picky as to the type that I enjoy. There are two main types of cider donuts, the heavier, cakey ones and the lighter, softer ones. I prefer the lighter, softer donuts, such as those from Russell Orchards in Ipswich. They capture the taste of the apple as well as the spices that are added. With the more cakey donuts, you feel full after having one. They also tend to be more dry than the lighter donuts. So why do more farms seem to make the cakey cider donuts? What are some of your food & drink issues with the fall? 1) Spice up the after-work hours every weekday from 5pm-7pm at Papagayo in South Boston with an all new Piñata Drop Party. Throughout the month of October 2015, guests will have the opportunity to take a whack at “Earl,” Papagayo’s soon to be infamous piñata, for a chance to win dinner for two and other prizes while enjoying tacos paired with a Maestro Dobel margarita of the day for only $15 per person (tax and gratuity not included). Every Monday through Friday beginning October 5th, guests can choose from a variety of taco plates such as the Ahi Tuna Tacos with seared rare tuna, poblano-napa cabbage slaw, pickled beets and vinegar laced radish; Vegetable Tacos with chili tempura cauliflower, grilled scallions, pickled red onions and julienne cucumber, and the Conchinita En Pibil, steamed in banana leaf, orange-habanero salsa and cilantro. All taco plates come complete with a daily special margarita made with Maestro Dobel, the world's first clear, multi-aged tequila. At 6:50pm each night, those that ordered the special will have the opportunity to step into the ring with “Earl,” on a first come, first serve basis, and smack the goods out of him. To make things even more interesting, those that want to take a whack will have to don “drunk goggles,” leveling the playing field for all. The winner that breaks the piñata will win dinner for two, but everyone that signs up to swing will receive swag. Guests that order the piñata special will have the opportunity to sign up with their server or bartender upon placing the order. Note: Sign up is on a first come, first serve basis. For reservations, please call 617-423-1000. 2) There is a new dinner series at BOND Restaurant|Lounge at The Langham, Boston. Inspired by the culinary team at The Langham’s interest in sustainability, the BOND 200 dinner series are planned specifically to pair with New England-sourced beers, wines and spirits, and features ingredients sourced from within a 200 mile radius of the hotel. Starting October 15 , BOND 200 will take place on the third Thursday of every month, featuring a 3-5 course prix fixe menu for $65 per person. The first BOND 200 Dinner on October 15 will feature the vodka, rum, gin and whiskey from the Gloucester-based Ryan & Wood Distillery. Unlike most specialty dinners, instead of planning the menu and then pairing it with the right beverage, the BOND 200 series was planned around the alcohol pairings. Executive Chef Mark Sapienza and his Chef de Cuisine, Sean Morrison, have created an inventive menu for the first BOND 200 dinner featuring Ryan & Wood Distillery, pairing each course with a different local spirit. --Dessert of Baked Baldwin Apple and Spiced Walnut Cake with Candy Cap Mushroom Ice Cream, Rum Caramel, Dried Pomegranate and Cape Gooseberries paired with Folly Cave Rum. 3) underFIRE in the Back Bay is pleased to announce Street Taco Tuesdays--a delicious shoutout to Mexico's favorite fast food fare. Smaller and more portable than American-style tacos, underFIRE's street tacos will be priced at $2 and $3 dollars apiece as well as an $11 dollar all-you-can-eat option. Fillings will include braised short ribs, BLT, grilled chicken with chipotle crema, braised pork with tomatillo salsa and shredded pork with pineapple salsa. In the spirit of true South of the Border street food, underFIRE has installed an authentic taco truck oven behind the bar. This compact cooking device allows the restaurant to make Street Tacos to order--literally before customers' eyes. That means tacos ala minutos--the freshest, most individualized tacos in the city. 4) Puritan & Co. Chef/Owner Will Gilson, Chef de Cuisine Alex Saenz, Wine Director Peter Nelson and the restaurant’s talented team are featuring Mas de Daumas Gassac wines for their upcoming wine dinner. Guests will enjoy a variety of the French wines including N.V. “Rosé Frizant” Pays de l’Herault, 2011 Mas de Daumas Gassac Blanc, Pays de l’Heurault 2013 Mas de Daumas Gassac Rouge, Saint-Guilhem-le-Désert, and a seasonal menu prepared by Chef de Cuisine Alex Saenz. Tickets are $95 plus tax and gratuity, and can be reserved by calling 617-615-6195. Puritan's wine dinners are very cool and tasty events and I highly recommend that you check out their next event! Fall will arrive in a couple days and besides cooler weather, it also brings the start of the busiest wine-buying season. The next few months, until New Year's Day, will see wine stores packed with consumers seeking wine to serve at parties and holiday dinners as well as to give as gifts. The holidays of Thanksgiving, Christmas, Hanukkah, New Year's Eve, and more bring out people seeking wine. For some people, this might be the only time they visit a wine store during the entire year. For other people, this might be the only time during the year that they spend so much on a single bottle of wine. The commonality of many of the wine consumers at this time is that they need help in selecting wine. They want wine and food pairing advice, as well as help in selecting the perfect wine to give as a gift. Some want advice in choosing a diverse mix of wines for a party. Some are seeking wine values while other want to splurge. However, buying wine can be intimidating and frustrating so what should these consumers do? What is the single, most helpful advice to assist them in choosing the best wines for their needs? Forget wine scores, badges, contest medals, critter labels, celebrity endorsements and such. Though they may offer some questionable value to consumers, they are not, by far, the most valuable information you could garner about wine. The recommendations of wine bloggers, wine columnists, friends, family and others also have limited value. The problem is that when you visit a wine store, they might not carry the wines that were recommended to you. So what do you do then? I am often asked for Sake recommendations and though I could easily rattle off a half dozen or so, I rarely do so. Whatever I recommend might not be available at that person's local or favorite wine store so my recommendations become nearly worthless. Instead, I suggest that they go to their chosen wine store and take a photo of their Sake selection and send it to me. I can then give them recommendations based on the Sakes that are available at that store. That works much better than a blind recommendation. However, if you don't have such an option at hand, then my best advice is to ask the wine store owner, manager or employee for advice on selecting your wines. It is simple advice but can be extremely effective, with the caveat that you need to shop at the right wine store. You need to shop at a store with passionate owners and staff, knowledgeable people who can help you find wines that best fir your needs. Not all wine stores are the same. Not all provide the same level of service. You need to locate and patronize the best shops. Let me provide you some recommendations for my favorite wine shops. This is not a comprehensive list and there are plenty of excellent wine stores that I haven't mentioned here. Consider this list a starting point only, and feel free to add your own wine store recommendations in the comments. Buy and drink plenty of wine this season! 1) On September 23, at 7pm, Brass Union will host the next event in their “Brass Pair” series – a monthly pairing dinner where the Union Square eatery and lounge joins forces with local brewers, distillers, wine makers and sommeliers – for a night of interactive cuisine and beverage. In this “Brass Pair” evening, Brass Union will team up with Ireland-based Glendalough Distillery for a savory five-plus-course dinner prepared by Executive Chef Jonathan Kopacz with accompanying sips hand-selected by Glendalough’s Brand Manager, Donal O'Gallachoir and Brass Union’s Beverage Director Paulo Pereira. Guests also will have the chance to imbibe on an exclusive barrel-aged cocktail that soon will be available for purchase at Brass Union. Tickets are available via EventBrite: brasspair9.eventbrite.com. This event is reserved for ages 21+ with proper ID. This sounds like a fantastic event and not enough restaurants do Whiskey pairing dinners. And where else can you find Whiskey Caramel Corn? 2) With several years of revitalization under its belt, Somerville’s East Broadway neighborhood is presenting the vibrant flavors of more than a dozen restaurants at the East Broadway Foodie Crawl on Tuesday, September 29, from 6 pm to 8:30 pm. East Somerville’s restaurant corridor features some of the area’s most authentic flavors and hidden gems. A ticket to this tasting tour gives its holder access to more than a dozen restaurants representing five continents and provides food samples and a glimpse of the experience at each. The Foodie Crawl invites participants directly inside each participating restaurant for a walking and tasting neighborhood tour that sets it apart from other food events and festivals. The experience includes the sights and smells of Ethiopia, the tastes of El Salvador and the colors of Haiti, among many others. East Somerville’s beautiful streetscape provides outdoor seating and music and entertainment for more than 1,000 people enjoying the crawl. This year’s event promises to be particularly exciting as it comes in the midst of the “This Is East” project that has rejuvenated the neighborhood, inviting residents to participate in the creation of artwork, video installations and other cultural projects that reflect the rich cultural fabric of the neighborhood. All proceeds from the Foodie Crawl benefit East Somerville Main Streets, which is committed to building a safe, sustainable and prosperous multicultural community by developing a vibrant businesses district at the neighborhood’s heart. The event has a rain date of September 30th. 3) On Monday, October 5, at 7pm, Beacon Hill Hotel & Bistro (BHHB) invites guests to take a tour of Spain’s Rioja region during a four-course wine dinner featuring the culinary stylings of Executive Chef Lucas Sousa perfectly paired with four wines from Francos-Españolas Winery. Cecilia Rait, proprietress and wine director of BHHB, and a representative from the winery will guide diners through the history, curiosities and nuances of each selection. Franco-Españolas Winery is one of the largest wineries in La Rioja. With almost 125 years of history and its exceptional location on the banks of the Ebro River, it produces some of the region’s finest wines. This intimate adventure is set in communal seating to encourage conversation, laughter and fun. For $65.00 per person (tax and gratuity not included), guests are treated to four wines, a four-course dinner and Cecilia's and Tracy's good cheer, humor and expertise. Reservations are encouraged as the event will sell out fast so please call 617-723-7575. 4) On September 28, at 6pm, The Tip Tap Room owners Brian Poe and Gordon Wilcox will host the 2nd annual “Chefs for Clefts” fundraiser at their Beacon Hill hotspot to benefit Massachusetts General Hospital’s Global Surgical Initiative. Funds raised from the charitable fête will directly assist Dr. Jay Austen’s missions that support children with facial deformities and cleft lips as well as burn victims in Colombia. Brian Poe (The Tip Tap Room; Poe’s Kitchen at the Rattlesnake; Bukowski Tavern – Cambridge; CLUCKIT!) and chef friends Andy Husbands (Tremont 647; Smoke Shop), Chris Coombs (Boston Chops; Deuxave), Douglas Rodrigues (The Tip Tap Room), Jason Heard (East Coast Grill), Jose Duarte (Taranta), Lydia Shire (Scampo), Mark O’Leary (Shōjo), Michael Scelfo (Alden & Harlow) and Rodney Murillo (Davio’s Northern Italian Steakhouse; Davio’s Cucina) each graciously have donated a three-course “dinner for ten” with wine pairings at their respective restaurants which will be up for bid during the live auction. Supporters also will have the opportunity to mix and mingle with some the City’s top culinary luminaries who will be present at this evening with a cause. MORE INFO: To purchase tickets, please visit: https://www.eventbrite.com/e/chefs-for-clefts-tickets-18142519765. Additional donations for Massachusetts General Hospital’s Global Surgical Initiative will be accepted onsite or via EventBrite. 5) Join Davio’s Northern Italian Steakhouse, E&J Gallo Winery and the Taste of the NFL in the fight against hunger. Since 1992, Taste of the NFL has raised over $22 million dollars for hunger relief agencies across the country to help kick hunger. Davio’s is proud to support hunger relief and by purchasing one of the selected wines listed below, meals will be provided to local food banks across the country by Gallo Wines (through December 2015). Gallo’s “Wine-By-The-Glass” program includes more than 15,000 restaurants nationwide that support Taste of the NFL throughout the year. The wine program expands the local impact of Taste of the NFL’s presence in the San Francisco Bay Area leading up to Super Bowl 50 and the Taste of the NFL’s annual “Party with a Purpose®” event. 6) On October 6, at 6:30pm, Legal Sea Foods in Park Square will host a seminar and wine dinner with Joseph Phelps Vineyards. Established in 1973, Phelps bought the 600-acre Connolly cattle ranch in Spring Valley and began planting vineyards and construction of a winery. Four decades later, the flagship wine, Insignia, is recognized as one of the world’s great wines. Joe became a leader in a remarkable group of entrepreneurs who launched a new era of excellence in California wine. I've lamented before how smoky Mezcal seems to often be overshadowed by the more popular Tequila. Despite the quality and versatility of Mezcal, a number of Mexican restaurants carry few, if any Mezcals, and rarely showcase it in cocktails. Fortunately, there are some Mexican spots which believe in Mezcal as much as they believe in Tequila. Ole Mexican Grill, located in Inman Square, is one such restaurant and they have an impressive selection of this intriguing alcohol. Last night, I attended an event at Ole and also spent some time, before and after the event, on my own at the bar, sampling a few selections. The Mezcal Vago Elote ($14) is an unusual Mezcal which is infused with roasted corn that is grown on the estate, With a mild smokiness, the sweetness and flavor of the corn is prominent, enhanced by some herbal and citrus notes. This would be a nice introductory Mezcal, as the smokiness is restrained and the slight sweetness makes it a bit more mellow. For Mezcal lovers, it presents a more unique taste profile which should intrigue and satisfy. Mezcal may be much less common than Tequila, but there are other Mexican spirits which are even rarer. In fact, last night at Ole was my first time encountering two such spirits, Raicilla and Sotol. Raicilla, made in Jalisco, is produced from the agave plant though it doesn't qualify for the legal definition of Tequila or Mezcal. In some respects, it is considered the moonshine version of Mezcal. Ole carries two Raicilla products from La Venenosa though I didn't try either of them. I will remedy that on my next visit to Ole, but I did try the other spirit, Sotol. Sotol is produced only in the state of Chihuahua, and has a history extending back approximately 800 years. It is made from a different type of agave, a wild variety known as Dasylirion Wheeleri, which grows in the Chihuahua Desert, usually on rocky slopes, as well as parts of Texas, Arizona and New Mexico. This variety is more commonly known as Desert Spoon and in Spanish it is known as Sotol, so the name of the spirit is the same as the plant. It takes about 15 years for the Desert Spoon to mature and then it is harvested to make Sotol, though one plant yields only a single bottle of Sotol. In comparison, the typical Blue Agave plant yields about eight bottles of tequila, meaning that Sotol production is much lower than Tequila. Like Tequila, it comes in various age classifications, including Plata (unaged), Reposado (several months to a year), and Anejo (aged at least one year). It also is usually about 76 proof, making it slightly less alcoholic than a typical Tequila or Mezcal. I tried the Hacienda de Chihuahua Plata ($9), which is pictured above, and the distillery has been around since 1881. The Desert Spoon plants they harvest are all wild and their Sotol is certified Organic by the USDA. It also has a Kosher certification. During the production process, Champagne yeasts are used and the Sotol may be double or triple distilled, dependent on the bottling. For those they age, they use new French oak, and age one of their bottlings, the H5, for at least five years. The Plata is their unaged version, giving a pure taste of the Sotol. Speaking to the bartender at Ole, it seems the Sotol needed some time to breathe when it first came to the restaurant, initially being too rough and almost off putting. But with some air and time, that roughness largely vanished and it became a much more mellow spirit. I felt that its aroma reminded me of tequila, with pleasant herbal notes. On the palate, it was fairly smooth with only a subtle bite, mostly on the finish. The flavors were intriguing, with nutty notes, plenty of herbs and some rustic, earthy elements. It is definitely a cousin to Tequila but possesses its own distinctiveness. I very much enjoyed it and want to seek out more Sotol. I was also intrigued to learn that Genius Gin, a Texas distillery, is starting to produce Texas Sotol. As the Desert Spoon plant grows in a few U.S. states, it isn't a surprise that a U.S. distillery has decided to create their own version of Sotol. For now, seek out Mexican Sotol and Ole Mexican Grill can help you explore this spirit. Does anyone else know any other restaurants or liquor stores which carry Sotol? In a couple weeks, on October 1, it will be time raise an ochoko and celebrate Nihonshu no Hi, or as known in English, Sake Day. Saké Day originated over 35 years ago, in 1978, by a declaration of the Japan Sake Brewers Association and is now celebrated worldwide. What will you do to celebrate this holiday? One thing I hope you won't do is have an infamous Sake Bomb, which is an American concoction, not a Japanese one. For a Sake bomb, you first start with a glass of beer, sometimes a Japanese one like Kirin or Sapporo. You then fill a small Sake cup with warm Sake. Next, you then place two chopsticks in a "V" shape atop the beer glass and carefully balance the Sake cup atop the chopsticks. You then slam your hand down on the table or bar so that the Sake cup falls into beer and immediately chug the beer and Sake mix. To me and many others, this is a waste of good Sake. The amount of Sake is very small compared to the amount of beer so you really are not going to get any flavor from the Sake. Basically, you only get the added alcohol from the Sake, so it really could be any liquor that you drop into the beer. Would you drop a shot of Chardonnay or Chenin Blanc in a beer? Probably not and you don't see restaurants advertising Chardonnay Bombs. Yet it is really no different than dropping a Sake into a beer. Sake is a fascinating beverage on its own and dropping a glass into your beer doesn't provide you any part of that fascination. Join with me and support Sake on its own! Don't allow this excellent beverage to be sullied with beer. Don't let its subtle and complex flavors to be destroyed by the strong, harsh flavors of beer. 1) On Sunday, September 27, at 6:30pm, Osteria Nino will host its first “Sunday Supper” event to benefit the National MS Society’s Greater New England Chapter (Waltham) whose mission is to drive research for a cure and to address the challenges of everyone affected by MS. At this family-style dinner, Osteria Nino has enlisted help from their friends at The Farm School (Athol), a nonprofit organization and working farm that trains and educates people about the farm industry. One of Osteria Nino’s favorite farms in New England, the Farm School specializes in certified organic vegetables, 100% grass-fed beef, pastured pork and more. COST: $75 per person (includes beverage pairings; tax & gratuity not included). A portion of the proceeds benefit National MS Society’s Greater New England Chapter and the Farm School. Reservations are required via EventBrite at: http://sundaysupperatnino.eventbrite.com. This event is open to all ages. Patrons must show a valid 21+ ID to consume alcohol. 2) From September 9 to October 3, Bistro 5 will offer one of my favorite tasting menus, the Heirloom Tomato Tasting Menu. Chef Vittorio Ettore always prepares an amazing dinner and the variety of tomatoes he uses is both intriguing and delicious. I highly recommend you check out this dinner. 3) The sixth annual Raise Your Glass for Jimmy presented by the Jimmy Fund Council of Greater Boston will take place 6-9 p.m. on Friday, Oct. 2 at the Battery Wharf Hotel in Boston. All proceeds support adult and pediatric cancer care and research at Dana-Farber Cancer Institute. Admission to the event includes a wide variety of beers and wines to taste from August West Wines, Blue Hills Brewery, Boston Bottle, Gordon's Fine Wines and Liquors, Mayflower Brewery, Medusa Brewery, M.S. Walker, Plymouth Bay Winery, and Wormtown Brewery. The event also includes hors d'oeuvres, live music, and a silent auction. Tickets are $75 per person, and early bird pricing is available with two tickets for $125 if purchased before Sept. 21. The first 150 guests at the door will receive a $25 gift certificate from Tresca. For more information, visit www.jimmyfund.org/raise-your-glass. 4) Confectioner Lee Napoli, whose history in pastry and candy in this city spans three decades, has been quietly conducting chocolate-making classes in a kitchen on the corner of Dartmouth and Montgomery streets in the South End since closing her retail shop, Chocolee Chocolates, in 2014. Often sold out months in advance, the classes were a local secret spread strictly by word of mouth ... until now. Beginning Saturday, September 26 and continuing every first and third Saturday of the month thereafter, Lee is bringing news of her classes out of the shadows and into the light. Chocolate class dates for 2015 are: September 26, October 3, October 17, November 7, November 21, December 5 and December 19. Each two hour class, held from 2-4 PM, begins with classroom instruction, then shifts to a commercial stove where chocolate tempering, truffle-rolling, and nut bark-ing become a messy but engaging activity open to "students" age 18 and up. Cost is $75 per person, with space in the class reserved by major credit card. When class concludes, each student goes home with a one pound box of artisanal candy (retail value $40-50) that they made with their own hands, plus recipes. Napoli notes that her classes are "great for corporate team building, bachelorette parties, father-daughter outings, or truly unique birthday gifts." Pre-registration for 2015 chocolate classes begins this week. Go to www.chocoleechocolates.com or call 617-236-0606. It is a chain restaurant, with 26 locations, so some might dismiss it outright. However, as I've said before, not all chain restaurants are the same. They must each be judged on their own merits and not simply ignored because they happen to be a chain. It is fine to be skeptical, as long as you are willing to give them a chance to prove you wrong. I've recently made a couple visits (one as a media guest and the other on my own) to the Margaritas Mexican Restaurant in Medford, at the Station Landing development. The chain was founded in 1986 and they now have 23 locations in New England, including seven in Massachusetts. The owners have made numerous trips to Mexico, for inspiration for their food and drink, as well as to purchase artwork and furniture for their restaurants. The artwork, which is throughout the restaurant, is very cool especially knowing it was all made in Mexico. There are many bright colors as well as some more somber pieces. It is a large restaurant with a festive vibe, a good-sized bar and plenty of different dining areas. IY would be good for families or co-workers seeking a drink after work. It is also good for a group of friends to dine and chat, or a place for a casual date. The Medford location has plenty of free parking, though you will face lots of traffic in the area around rush hour. You might want to start your lunch or dinner with a Margarita ($7-$10), and you have over twenty options available. Instead, you could go for a Mojito, Martini, Sangria or a Mexican beer. I tried the Red Berry Sangria, a blend of red wine with fresh fruit, pomegranate juice & cranberry juice, and then topped with brandy and pomegranate liqueur. It was pleasant, refreshing and not too sweet. The wine list is small, with the usual suspects, and it would be better to opt for a Margarita. The menu has about 25 different tequilas, which you could always order on their own as well. The Original Margarita ($7.29) is good, not too alcoholic, and with plenty of bright citrus flavors. They make their own Margarita mix, called Squeeze, with fresh fruit juices and egg white, and it is also available for sale on its own for about $7. This Squeeze makes an excellent Margarita and I have bought a few jars and used them at home to very good success. I also got to try The Beehive Paloma, an intriguing drink made with Hornitos Spiced Honey Tequila and Jarritos Grapefruit Soda. It is carbonated like a soda, with vibrant grapefruit and citrus flavors. It wasn't overly sweet, the honey notes just accenting the citrus. An excellent and refreshing summer drink. My favorite Margarita was the Naked Jalapeño ($9.99) which I had two ways, the basic as well as frozen. It is made with Tanteo Jalapeño Tequila, fresh lime, triple sec and simple syrup. I loved the spiciness of the tequila, especially in the frozen drink. Again, this drink is not overly sweet, being nicely balanced with the heat of the tequila. I've also been making my own Margaritas at home with Tanteo Jalapeño Tequila. It's been easier as a won a blender during the media visit. I was surprised to learn that all of their food is made in house, from chips to salsa, guacamole to enchilada sauces. The menu is extensive, with much that is familiar, including Tacos, Fajitas, Burritos, Enchiladas, and Quesadillas. Basically everything costs under $20, with plenty in the range of $10-$15, making it a very affordable restaurant. In addition, they have a number of Daily Specials with even cheaper items. For example, they have a Happy Hour during the week with $5 Margaritas, $3 Tecate Beer, and appetizers from $1-$5. They also have another special every day, Two For $25, where you can get an Appetizer and two Entrees for only $25. They hand-make Guacamole ($6.99) about 10-12 times a day; and you can have them add special ingredients, including Bacon, Fire Roasted Corn Salsa, Shrimp and Pineapple Salsa. I'm not a Guac guy, but my dining companions seemed to enjoy it very much. The Mexican Grilled Corn: ($6.99), topped with chipotle aioli and queso fresco, had a nice char and a sweet and smoky taste, with the creaminess of the queso. A fine choice for an Appetizer. 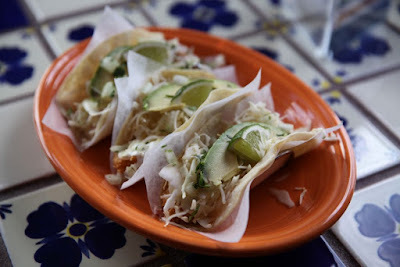 The Fish Tacos del Mar ($11.29) are Baja style tacos with beer-battered fish, onion, cilantro, orange slaw, mild three-pepper sauce and avocado on white corn tortillas. Fresh ingredients, a nice crunchy batter on the fish, and a nice blend of flavors. 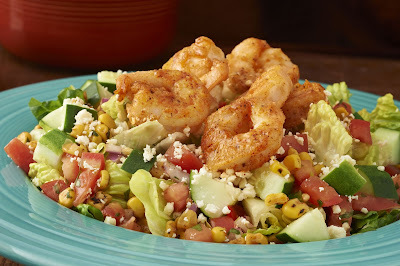 The Coconut Shrimp Salad ($12.79) has magic dusted shrimp tossed in coconut sauce over lettuce, salsa fresca, roasted corn salsa, cucumbers, & queso fresco with a tequila lime dressing; Again fresh ingredients with tasty and balanced tastes. The dressing was especially appealing, and made a great topping for the salad. My only quibble with this dish is that the shrimp comes from Thailand, and I would question its sustainability, especially in wake of the huge Thai slavery scandal. Why not buy U.S. Gulf shrimp instead? The Carnitas Enchilada in Tomatillo sauce ($14.79) are slow-roasted pork tucked inside a corn tortilla with a blend of cheeses, topped with housemade tomatillo sauce and then baked. The pork was tender and flavorful, and there was plenty of gooey cheese and a slightly smoky tomatillo sauce. A hearty choice. For Dessert, the Fried Ice Cream ($5.99) is an excellent choice. Vanilla ice cream with a crushed pretzel shell that is covered in your choice of chocolate sauce, honey or both: A nice blend of salty and sweet, and it is big enough to share. Another one of their Daily Specials is the All You Can Eat Tacos ($9.99) on Tuesday. You get to choose between ground beef and chicken, hard or soft tortillas, and it comes with rice and beams. You could sit there all day, ordering taco and after taco until you burst. This is certainly a a great deal and you won't leave hungry. Overall, I thought the food I tasted was good and definitely a nice buy for the money. The food seemed fresh, with balanced flavors, and should satisfy. It rises above the perceived stigma of being a chain restaurant and is worth checking out. Today is Labor Day, a national holiday "dedicated to the social and economic achievements of American workers." It is celebrated on the first Monday every September and is often seen as the unofficial end of Summer. For many people, it is a time for parties and BBQs, eating and drinking. Some may go away for the long weekend, maybe to spend the last weekend at the beach, while others may simply visit a friend or family member's home for a celebration. Not much thought seems to go into the idea behind this national observance. I'm hoping that everyone takes at least a little time to think about the meaning of the holiday, and to especially give thought to the food service industry. Servers, bus persons, cooks, dishwashers, bartenders, hosts/hostesses and more. They work hard to bring you pleasure, to provide you delicious food and drink to satisfy your cravings and urges. They deserve our gratitude and recognition for all their hard work. The best way to help all of these workers is to patronize more restaurants, to dine out more often. Last winter, with all of the snow that fell, was a tough time for restaurants and hopefully we won't see a repeat this winter. Each month, numerous restaurants close and if you want your favorite restaurants to survive, you need to patronize them more often. Give them your support! And when you dine at these restaurants, make sure to tip properly as many of these workers greatly depend on your tips. The issue of tips has garnered lots of press lately, with heated discussions over what is proper, whether restaurants should go tipless, and much more. Patrick Maguire, of I'm Your Server Not Your Servant, has written a number of articles about the issues surrounding tips, providing thoughtful discussion. The main point to remember is that you should tip fairly, and you really need to stop and think about what is fair. For example, last month, Maguire made reference to one of his older posts, Overtip Breakfast Servers, an article that illustrates well the issue of fairness in tipping. Most people tip based on the size of their check. With breakfast, especially if ordering the specials, the check could very well be low, often under $10. However, your server probably will work as hard serving your breakfast special as they might be a pricier lunch or dinner. It wouldn't be fair to give the server a tip based solely on the size of the check. However, how many people think about that matter? Will the Boston Red Sox defeat the St. Louis Cardinals and win the World Series or will a supernatural terrorist act bring death and chaos instead? For four months, since the brutal murder of his beloved wife and son, Nate Randall, the Tipsy Sensei, has been in mourning at a lake house in New Hampshire. Hato, an immortal samurai and Nate's friend, convinces him to return to Boston, to investigate a new supernatural threat, one with its origins in the darker aspects of World War II. Soon enough, Nate and Hato find themselves facing a terrible threat which is connected to the dead and has no compunction at torturing and murdering innocents. As they struggle to unravel the mystery behind a series of horrific crimes, Nate and Hato face some of their most dangerous foes ever, including a master swordsman who could even be more skilled than Hato. Due to these perils, Nate and Hato recruit Detective Jessica Mayer to assist in their investigations. Eventually, their investigation leads them to the historic Fenway Park, during the World Series, which may be the target of the threat. Can Nate, Hato and Jessica prevent their supernatural enemies from launching what could be greatest terrorist act on American soil? And even if Nate, Hato and Jessica can succeed, what will be the cost? 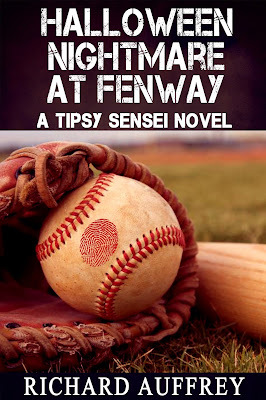 The Tipsy Sensei series continues in a new novel, Halloween Nightmare At Fenway, that is now available as an e-book on Amazon and it will be available as a trade paperback later this month. 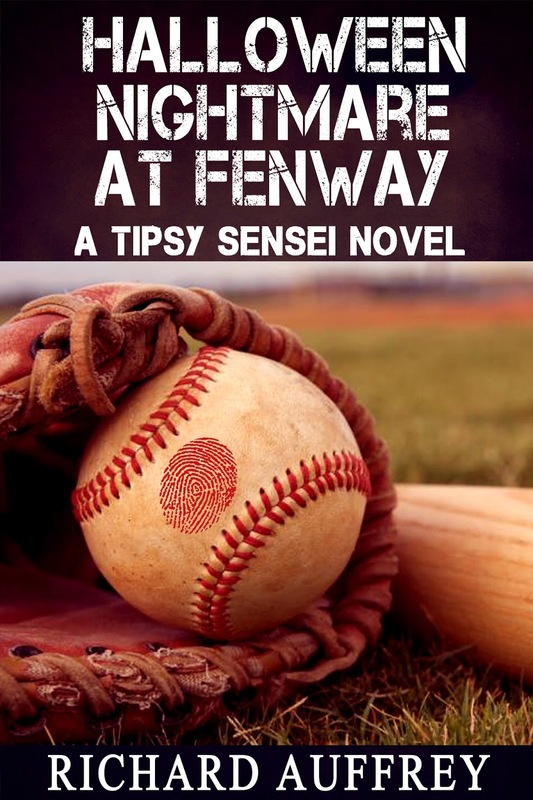 Prior to reading Halloween Nightmare At Fenway, you might want to read the prior two Tipsy Sensei novels: Demons, Gods & Sake and Hand Fed Tigers. I'll also note some of the restaurants mentioned in this new novel, including Bergamot, Dumpling Café, JM Curley, Oishii, Painted Burro, Posto, South End Buttery, Taberna de Haro, Taranta, and Tasting Counter. Kanpai and I hope you enjoy my new novel, Halloween Nightmare At Fenway. 1) On September 16, Osteria Nino will host their first pairings dinner since debuting in Burlington in April. This authentic Roman kitchen will team up with Massimo Ballabio, Export Manager of Marsuret Prosecco, for an evening celebrating the best Italian tastes from land, sea and the vine. Osteria Nino’s executive chef, Walace Benica, has designed a menu centered on expertly-sourced local ingredients that will transport guests back to the Old Country, honoring the timeless techniques and flavors of “cucina italiana.” To complement Chef Benica’s cuisine while highlighting Osteria Nino’s all-Italian wine program, proseccos from Marsuret will be featured. Founded in the 1936 by Agostino Marsura, Marsuret is located in Veneto, Italy, and features 111 acres of estate vineyards that are planted on the enchanting Treviso hills. Reservations are required via EventBrite at: http://marsuretatosterianino.eventbrite.com. This event is reserved for ages 21+. As I've said before, Osteria Nino is one of the hottest restaurants to open this year and you really need to experience their cuisine. 2) In addition, on September 19, the Osteria Nino team will travel to Methuen to host an authentic “farm to table” dinner at Pleasant Valley Gardens near the Merrimack River. This “pop-up” culinary event will feature Italian, family-style culinary creations paired with local beer and wine selections. In keeping with the centuries-old Italian tradition, Osteria Nino’s mission is to make the most of the exquisite bounty of the land, manifested through its unparalleled sourcing practices and perfectly executed culinary techniques. Through unique “group outings,” the team at Osteria Nino visits farms throughout New England to gather a deeper understanding and respect for its abundant soils and livestock. With a daily changing menu dictated by the freshest and most peak ingredients of the season, Osteria Nino frequently sources from their friends, Richard and LuAnne Bonanno, operators of the 50-acre Pleasant Valley Gardens, whose farm has specialized in dairy, swine, vegetable and flower production for over a century. Reservations are required via EventBrite at: http://osterianinofarmdinner.eventbrite.com. 3) CHOPPS American Bar and Grill is excited to introduce Executive Chef Jeff Williams to the Boston culinary scene. Williams brings over seventeen years of experience in top kitchens around the country and a lifelong passion for culinary excellence to his new role at CHOPPS. Before relocating to Massachusetts earlier this year, Chef Williams climbed the ranks at some of San Diego’s most prestigious kitchens in addition to STK West Hollywood, Culver Hotel in West Los Angeles and Westin Bonaventure. With the guidance and expertise of Consulting Chef Daniel Bruce, Chef Williams and the CHOPPS team are introducing a new fall menu featuring seasonal dishes that remain true to CHOPPS’ signature style and focus on fresh regional ingredients. The new seasonal additions to the CHOPPS menu reflect influences by Chef Williams’ extensive background working with a variety of international cuisines and flavors. In addition to the signature antibiotic and hormone free cuts of beef and their modern twist on American classics, the new seasonal lunch and dinner menus will feature inspired seasonal plates. Highlights include unique appetizers like Yellowfin Tuna Tartare with crushed avocado, wakame salad and cucumber, inspired small plates including Soba Noodles with spinach, mushroom, and ginger soy and fresh seafood offerings including Salmon with yellow corn succotash, lemon thyme, and crème fraiche. The menu will also offer variety seasonal CHOPPS favorite soups, salads, pizzas, burgers and sides. CHOPPS fall lunch menu features small plates including Fish Tacos with cod, pico de gallo, cheese, lime and pickled carrots, a variety of classic sandwiches and burgers including the Dry Age Burger featuring River Rock Farms beef, BBQ aioli, cheddar, and crispy onions, and a lineup of fresh soups, salads and pizzas. If you haven't been to CHOPPS, now is the time to check it out. 4) On September 16, at 6:30pm, Legal Oysteria will host a wine dinner with the Artadi winery. Located in Northern Spain, a group of local winemakers founded Artadi in 1985. With careful cultivation and passion, the personality of the vineyard is one of tradition and preservation. The maintenance of these natural processes with a combination of respect for a historical heritage has resulted in the production of truly inimitable wines. Legal Oysteria will team up with Owner & Winemaker, Juan Carlos López de Lacalle, to host an exclusive four-plus-course dinner featuring signature cuisine paired with selections from the Artadi vine. 5) Joslin Diabetes Center, the world's largest diabetes research and clinical care organization, will celebrate its annual “ritmos de salud” event on October 1st from 6pm-10pm at the Artists for Humanity EpiCenter to benefit its Latino Diabetes Initiative (LDI). The benefit’s aim is to increase awareness about the high risk and impact of diabetes on children and families in the Latino community. The event will feature a fabulous array of food from some of Boston’s most renowned chefs led by culinary chair Chef Jose Duarte of Taranta. Guests will enjoy dishes from a number of renowned Boston area chefs- including Rodney Murillo of Davio’s Northern Italian Steakhouse, Manuel Sifnugel of Masona Grill, Brian Poe of the Tip Tap Room and many more - while listening to the upbeat Latin rhythms of Alexander el Cantante. Guests are also encouraged to join in on the dancing with a special performance by Boston’s own “Salsa Y Control” Dance Company. Co-chairing the event, well-known Latino business leaders Lazaro Lopez and Javier Bellini will welcome special guest and Red Sox legend, Luis Tiant, fondly known as “El Tiante,” who has type 2 diabetes. Diabetes is a disease of epidemic proportions across all populations, affecting certain racial/ethnic groups in even greater numbers. National data demonstrates that Latinos have a two-fold increase in the risk of developing type 2 diabetes compared to the Caucasian population. Joslin Diabetes Center’s Latino Diabetes Initiative (LDI) strives to improve the lives of Latinos affected by diabetes, or at risk for the disease, through culturally oriented patient care, education, outreach and research, as well as working to find a cure. 1) Sake surge in Singapore. The Straits Times has a lengthy article, Sake: Going With The Grain, with plenty of basic educational info about Sake types, brewing, and food pairings suggestions. In addition, the article reports on how Sake has become very popular in Singapore, making it the biggest market for Sake in Southeast Asia. However, it is still a young market and more Sake education is needed to inform consumers about Sake varieties, pairings and more. Within the past year, 18 Sake bars and restaurants have opened in Singapore and the article provides specific information for several of these new spots. As an aside, the article also discusses how Sake popularity in Japan has been growing, especially with young people and women, much of it due to increased media attention. It is always good to hear of Sake's growing popularity. 2) Sake, an offering to the gods. The Asahi Shimbun has an intriguing article on the revival of a traditional Ainu Sake. The Ainu Museum partnered with the Tanaka Sake Brewery, which is located in Otaru, a port city in Hokkaido, to recreate Tonoto, a traditional Sake of the Ainu. This unrefined Sake was named Kamuy Tonoto, "divine sake" though I have seen other sources which translate "tonoto" as "official milk." It is brewed with Japanese millet and rice koji, has about a 10% ABV, and tastes both sweet and sour. Masahiro Nomoto, director of the museum, says, “For the Ainu people, tonoto is not only traditional sake but also a crucial offering to gods and ancestors.” In a future article, I will be writing more about the Ainu and Sake consumption. 3) Sake, inspired by a sword. The Asahi Shimbun wrote about the Tuzyun Shuzo Co., a Sake brewery which was established in 1770 in the Kumamoto Prefecture. They have created a new Sake, Hotarumaru, which was inspired by a legendary sword which was allegedly used by the warrior Aso Korezumi during the battle against the Ashikaga clan in 1336. The sword was damaged in the battle, but the next morning, the warrior woke to find it was fully repaired. And during that evening, the warrior had a dream of fireflies swarming over this sword. The first batch of this Sake, about 300 bottles, sold out in hours and it was primarily women buying it! These women were mostly token joshi, "sword girls," who were fans of a video game, Token Ranbu, where swords are transformed into characters. The Sake is a Junmai Ginjo and is packaged in an appealing bottle. The second batch, 1000 bottles, also sold out quickly, in about six hours. This is another example of how more women in Japan are buying Sake. 4) More Sake being produced in the U.S. The Japan Times ir reporting that the growing market for Sake in the U.S. is leading Japanese breweries in the U.S. to up their production as well as to create new varieties of Sake. They understand the advantages they possess, lower costs and quicker delivery, and want to capitalize on these matters. For example, Takara Sake USA Inc.. has upped its production and has started making Yuki Nigori, a flavored Sake. Gekkeikan Sake (USA) Inc. and Ozeki Corp. have also expanded its production capacity. Though the article doesn't mention it, small artisan Sake breweries are also starting up in the U.S., helping to sate the growing desire for Sake. It will be fascinating to see what happens when they start producing Sake with Sake rice, like Yamada Nishiki.